Image: Kyle FOlksome/Getty Images. Design: Ashley Britton/SheKnows. In a professional context, two types of mistakes can cause serious problems. The first is a legitimately huge error that can derail progress and endanger your job, like missing a major deadline or blowing a crucial presentation. The second — and the more common — involves a small “whoopsie” that triggers overthinking on your part, which can cause the issue to snowball and become a much greater concern than it should be. 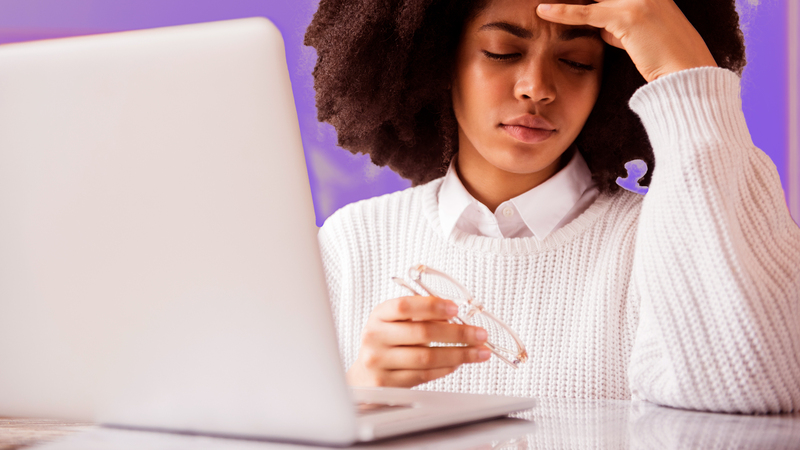 If you catch yourself mentally blowing your small mistakes way out of proportion, these six strategies can help you put these situations in perspective and find a productive way to move forward. In a recent article about mistake obsessions, Harvard Business Review refers to the tendency to overthink as “rumination.” When you feel your thoughts about a minor work mishap piling up in a distracting manner, try to figure out exactly what prompts these inner reactions. Next, come up with a game plan for smoothing over these triggers and making them more manageable for you going forward. For instance, if you find that you’re triggered by collaborations with people you don’t trust, it may be worthwhile to spend some off-the-clock time with your colleagues so that you can get a better sense of them and how they operate. Overthinking does kill your happiness. Since rumination is an obstacle existing entirely within your own head, re-scripting your thought processes can counteract their negative results and help you move on in a productive fashion. First and foremost, it’s important to give yourself some psychological distance by looking at the stressful situation from an external perspective. “One way to start to get this distance is by labeling what’s running through your head as thoughts and feelings, a tactic described in this article on emotional agility. So instead of saying “I’m inadequate,” you might say, “I’m feeling like I’m inadequate.” You can even be more light-hearted about it: “Oh, that’s just my ruminating mind overheating again,” HBR advises. Don’t fall in the trap of assuming that overthinking your mistake will inherently help you correct it. You don’t need to do “penance” for your work-related “sins” by mentally tormenting yourself about them. Instead of dwelling on the issue itself, frame your thoughts to focus on concrete steps you can take to fix any residual damage from the mistake or to help you prevent similar errors in the future. “To shift from rumination to improvement mode, ask yourself, “What’s the best choice right now, given the reality of the situation?” Start by taking one step, even if it’s not the most perfect or comprehensive thing you could do,” recommends HBR. Sometimes, the best way to get yourself out of a mental rut involves a simple distraction. When you’re once again circling the drain with thoughts about your mistake, get up and take a brisk walk through the neighborhoods, take a yoga class or give your kitchen a deep clean. An engaging activity that focuses your thoughts elsewhere will help you gain necessary distance and helpful perspective. You’ve figured out what sparks thoughts of your mistake, you’ve come up with a plan for preventing its recurrence, you’ve taken a long jog to distract yourself… and yet, you still can’t shake the sense that your minor error could have larger implications for your professional goals. If you really believe that the problem won’t be corrected without directly addressing it, then go ahead and schedule a sit-down meeting with your boss to talk through what happened and put a plan in place for repairing the damage. By proactively stepping up and showing your determination to fix your mistakes, you establish yourself as a capable and responsible employee. And finally, we bring you the most difficult part of this process: at some point, you have to forgive yourself and let. It. Go. Obsessing over a mistake doesn’t help you and it doesn’t help your company, and investing your energy in this manner can impede you from taking on new tasks and giving the proper amount of attention to other aspects of your work. It never feels good to make a mistake, but all you can do is acknowledge it, put a plan in place for preventing it in the future, clean up any residual damage, and keep on keeping on. This article originally appeared on Fairygodboss. As the largest career community for women, Fairygodboss provides millions of women with career connections, community advice and hard-to-find intel about how companies treat women.